eVoice – owned by j2 Global, the same company behind eFax, KeepItSafe and Speedtest.net – has been on the U.S. and Canadian market since its foundation in Los Angeles in 2000. This VoIP service provider is intended for sole proprietors and smaller businesses, with the choice between 4 cost-friendly pricing plans that hold the knowledge and power of the bigger virtual phone system companies. 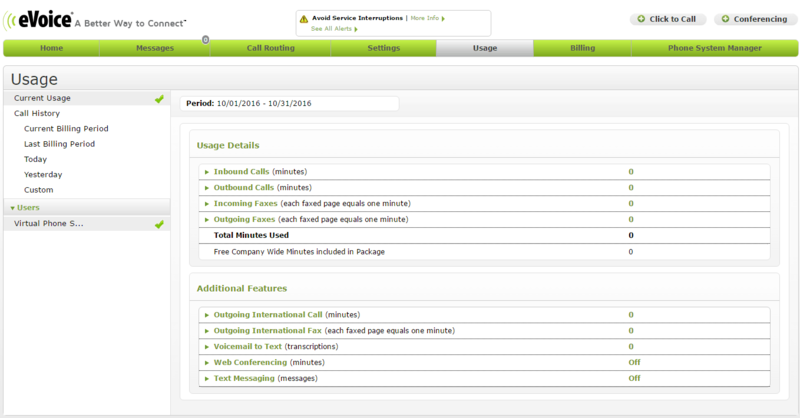 When you become a subscriber of eVoice for a longer period or for just the 30-day long free trial, you not only get local, toll-free or ported numbers for free, but you receive all features you need too; from several call handling options like call forwarding, holding, blocking, transferring to even conference calling. 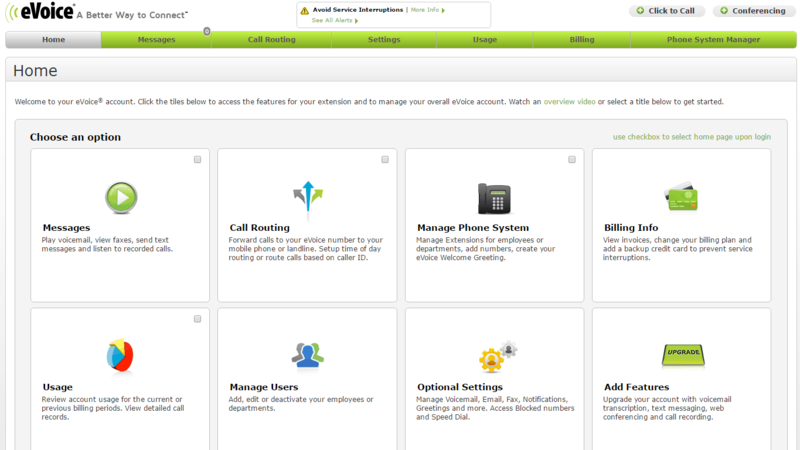 You also get various voicemail options, answering rules, auto-attendants and other customizable features that you can manage from your account using a computer or on the go using the mobile apps. eVoice also gives you the option to purchase additional features like two-way faxing, call recording and live receptionists to make your business seem truly professional. Basically eVoice has all features a decent business VoIP service needs – although some handy features like true voicemail transcription, two-way faxing, web/video conference calls and call recording are only included if you pay extra fees. Still, the most important call related features are all present: you can forward, transfer, schedule or block calls, see the call logs and get notified when you receive a call or a fax. You can set up various answering rules, customize your auto-attendant (which can be replaced by live, trained receptionists for extra, custom fees), record greetings or use the default ones by eVoice and receive business related text messages and start conference calls with almost a 100 participants. 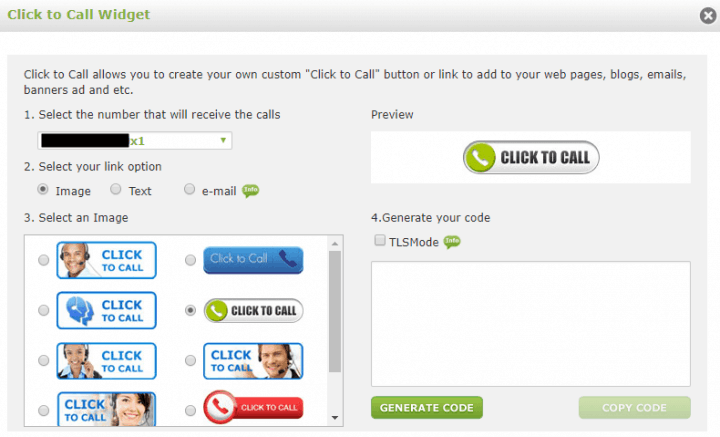 If you need to customize anything from the greeting message, the click-to-call widgets to the extensions and the phone numbers (or you want to check your voicemail boxes, your inbound faxes etc.) you simply need to access your fully cloud-based account. With the account, the homepage of which can be customized in almost any way you want, you will never be out of reach again as eVoice can be accessed from your computer, a mobile browser or the iPhone/Android app. 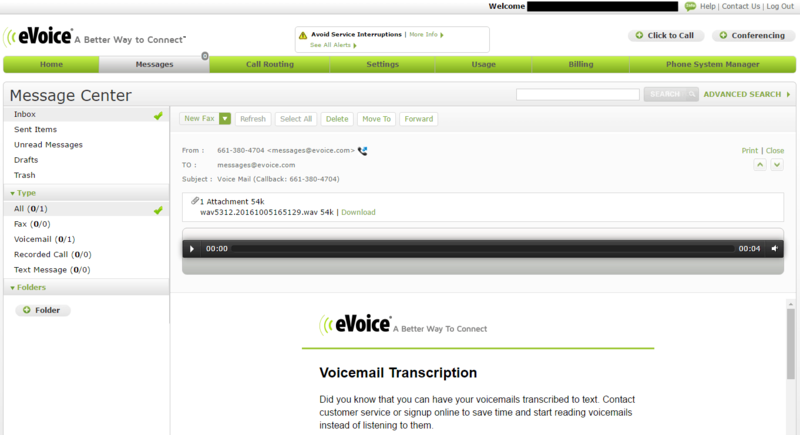 The call related features of eVoice are pretty impressive. You get the usual “suspects” like call forwarding to different numbers (even when you’re abroad), routing the call until someone picks up the phone (with simultaneous or sequential ringing), and transfer your calls to a different location within the office. 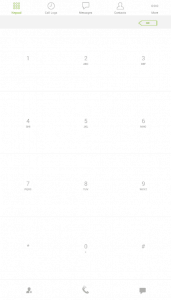 You can set up time periods when your calls are automatically forwarded to voicemail, which you can then forward via email or get notified thereof in an email or push notification. Furthermore, thanks to the advanced call scheduling, you are allowed to decide where to direct your calls when you are in the office. You can also determine the caller ID your callers will see, but they cannot hide their numbers from you, so you can decide whether to accept the call or block numbers for good. 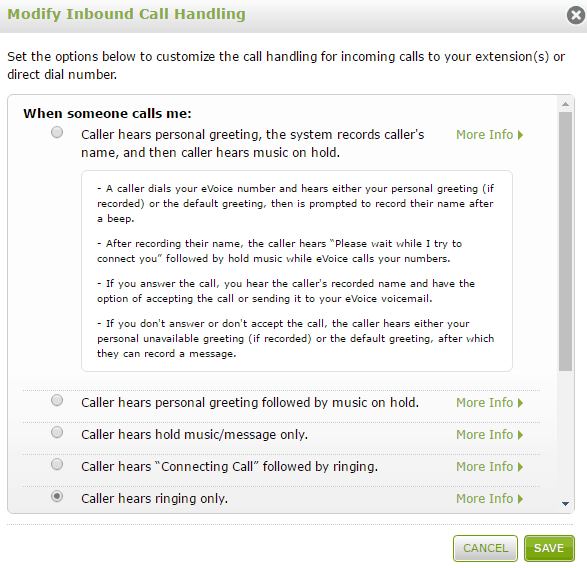 eVoice also supports call queuing, which is accompanied by the option to select your own hold music. There are other, advanced features too. First, there is conference calling that allows up to 94 people to join a single call by dialing a specific number. You can make outbound calls even when you are not in your office and set up countless answering rules (including those asking clients to provide their names). In eVoice you can also create a directory so your callers can dial your co-workers by name or set up a direct dial number for them. You are able to replace the existing voicemail box of your devices to that of eVoice and even receive inbound text messages. And last, but not least, eVoice allows its clients to customize and create click-to-call widgets which you can place on your website, emails, blogs etc. so callers can immediately contact you without dialing. Despite its many outstanding features, the desktop account, which logs you out if you are inactive, looks rather bland due to a design that dates back to the 2000s. However, it perfectly serves its purpose: the homepage can be customized to direct you immediately to the four most important subpages: voicemail, call routing, usage and phone system management. In the voicemail section you can see your messages, listen to them (after a double-click), get them transcribed (for an extra fee), and immediately call back the caller – even though the account does not support softphone. With call routing you can set up when and which numbers should be rang and in which order, or you can send all calls to voicemail right away. In the account you can also set up minor things like the outbound caller ID, the greetings, email notifications, put certain numbers on speed dial, manage users, the phone numbers, auto-attendants and the rules related thereto. However, two major features – conference calling and faxing – are pretty limited. Conference calling is not that problematic, but if you want the more advanced web conferencing solution, you have to pay an extra. 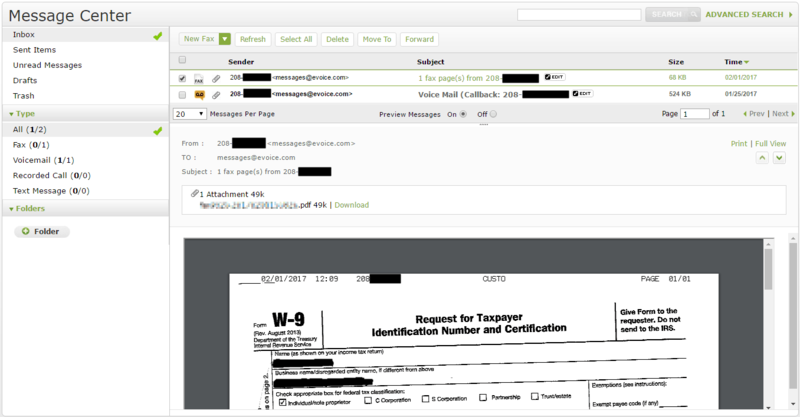 The same is true for faxing: even though you can receive them and forward them to a predetermined email address in PDF or TIFF, sending faxes is out of question unless you pay for it. And to make things worse, recording your calls or even sending and receiving business related text messages (via SMS) also requires further “donations” from you. eVoice is one of the few companies that don’t charge you for porting your number from another service. However, keep in mind that due to the throughput time you get a temporary number until your old number is set up. If you want a new number, you are lucky, because the process is relatively easy – whether you choose a local or a toll-free number. When you set up a local number, you just have to choose the state and the major city, while choosing a toll-free number always starts with picking one of the 6 prefixes (including 800). Furthermore, you can easily add new numbers later in your eVoice account within the amount determined by your subscription (see below). However, true 800 numbers are out of the question, while vanity and/or international numbers are always an extra: the former has a one-time $30 fee, while the latter is $29.95 per month. Good news: no matter which option you choose, whether it’s a mobile browser or the Android/iPhone app, you can easily manage your account from a mobile device. Even better news: none of the features are limited within the browser version/app. There are a few catches though. Even though the mobile version of the site is completely functional, it doesn’t adapt to mobile screens well, unless you hold your smartphone in portrait mode or you use a tablet. The catch with the mobile app is that there is no catch: it is simple, straightforward, works under 3G/4G/LTE networks, allows you to customize your home screen, and displays the most important functions like the keypad, the call log, your messages, and the contact list. The app is also capable of treating your personal and business voicemails separately, creating speed dial shortcuts, and giving you the option to use your eVoice number as the caller ID. The true online fax service of j2 Global, eFax is capable of turning your computer or mobile phone into a fax machine to send and receive faxes, attach electronic signatures thereto and share large files. This software is capable of encrypting your emails, filter all kinds of spam, and archive your mails whether you use it from a PC, laptop or a mobile device. When disaster strikes and you need a quick recovery service for affordable, customized prices then KeepItSafe is the right choice for you. If you need an integrated email marketing service, campaigner helps you with engagement tracking, ROI measurement and sales streamlining. 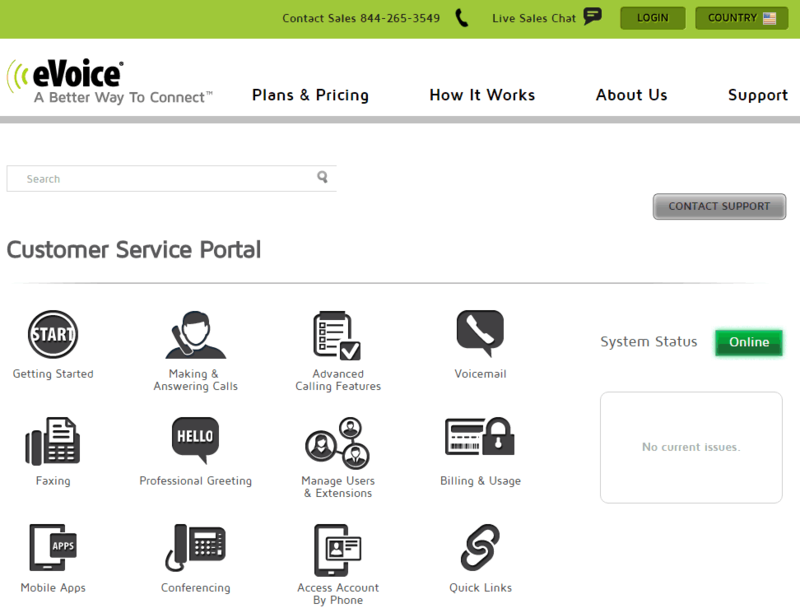 eVoice’s pricing policy is divided into two major categories: Professional and Small Business. However, the latter is further divided into 3 subcategories that only differ in subtle ways. Before we continue, there is one thing: all plans come with 2 lines, have all features with the option to upgrade the account with extras and a 30-day free trial. The Professional plan, intended for consultants and freelancers, is $12.99 per month, and includes 300 minutes, 2 extensions and 6 numbers. The prices of the 3 Small Business plans depend on the minutes, extensions and phone numbers. For $29.99 per month you get 1,000 minutes, 5 extensions and 15 numbers; for $49.99 per month you get 2,000 minutes, 10 extensions and 30 numbers; while for $79.99 per month you receive 4,000 minutes, 15 extensions and 45 numbers. There are some extra charges though. For instance overage charges are $0.039 per minute, getting a professional greeting is $25, while the fax via email or the voicemail-to-text feature is $1.95 per user per month. Call recording is at least $5.95 per user, sending and receiving business related text messages is $4.95 per user for 150 messages and the web conference feature is $19.95 per month. eVoice is one of the few companies that provide true 24/7 customer support, but its methods are a tad questionable: for example, only Small Business subscribers are entitled for “VIP support”. Through eVoice’s customer service you can submit a support ticket via the contact module or, and this is the most preferred contact method, initiate a call. In fact, the phone support is especially important, because this is the only way to cancel your subscription. Although live chat is only supported if you have sales related questions, you also have the option to leave a message on the company’s Twitter or Facebook page as all questions asked thereat were promptly answered. There is also a rather messy support page with the most important features of the service explained in great details, and the existence of the FAQ is questionable due to the detailed nature of the support page. However, if you prefer an audiovisual explanation of the features, eVoice is ready to help you with video tutorials uploaded to the company’s website and its YouTube page. 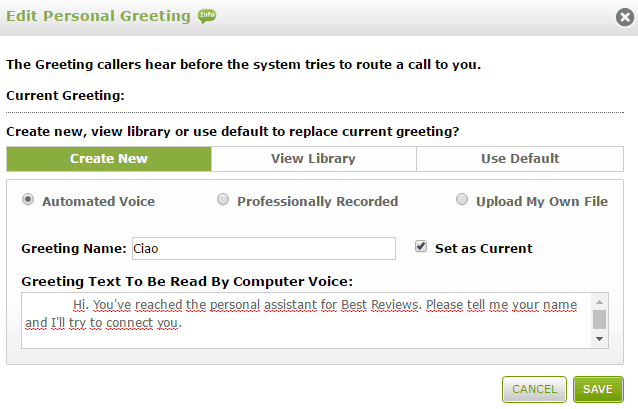 Although eVoice has some nice features, we still think it is a hit or miss. The company offers a complete virtual phone system with a more than satisfactory feature range available to users on all of its plans. All of the needed call handling features are there, with some advanced features like business text messages readily available. You don’t have to pay a nickel for number porting, you have the option to replace your auto-attendant with a live receptionist, and you are able to manage your account from any device that has a browser or from the two apps. By far the biggest problems are that certain features require an extra fee, and the different treatment of subscribers when they turn to the beyond average support. Sadly the account manager is quite lackluster, and true 800 numbers are not supported at all. eVoice is not perfect, but if you accept the limitations during your 30-day free trial, chances are you will be satisfied with the services of this VoIP provider. I have used eVoice for a long time. Probably 10 or 15 years, but I can’t be sure exactly — that’s just how very long it has been. For all of this time, I was very happy. I talked about it to friends and in online forums and may have caused them to get a lot of business … or none; I don’t know, but I’ve praised them highly for all of this time. All of a sudden — no warning, no notification, and no explanation — my phone number stopped working. After many calls and many e-mails and many posts on their “contact” Web page, I have NEVER gotten one response online, and by telephone, the only thing they tell me is that there is no such account. They even claim there is no such e-mail as mine associated with any account, even though I’ve got literally hundreds of e-mails they sent, delivering voice messages to me, over the years. I don’t know what the problem is, but I just know that there are dozens, if not hundreds, of companies and people who have my eVoice phone number — and many have no other way to get in touch with me. No e-mail and no snail mail addresses, and no other phone numbers. I love eVoice, and would sign up for another number, but I’m afraid it would not solve the problem, and now I see a lot of people have had billing problems over the years. Different people have different statistics, but for every person who complains about something, there is a large number of people with the identical problem who complain elsewhere, or don’t complain at all. So, I’d be worried they might choose to rip me off, if I sign up again. Besides, for the cheapest account they have — which has a lot of features I don’t need — I can go to Wal-Mart and take my pick of real telephones which will cost the same, or even less, per month. My wife has had a prepaid cell phone for more than a decade, it costs about $10 per month, and she uses it all she wants (Which is very little.) without worrying about limits. Reluctantly and sadly, I will get a similar phone to replace the eVoice which served me so well for so long. Customer support is terrible and the services second rate. I wish I would have researched this company before I invested in the phone number and had it printed on all my stationary and checks. If you are considering this service, I suggest you do some research on the company first and see how many people have been scammed. This company is A JOKE, the poorest costumer service I’ve ever had to deal with. My calls didn’t work properly, after feeling the person wasn’t aven caring about me I asked for a Manager and he said “there is no manager” how come a company with a 24/7 costumer support does’t have a manager. My problem wasn’t solved so I said I was going to cancel my account and he just proceed with the cancelation without even caring. Very bad service and very bad costumer service. Don’t buy this services they are misleading. Tells you anything to get you to sign up. Customer service is a joke. Was on hold for 20 minutes..I guess because customers were calling and complaining about there service. I give the a big fat 0. Customer service is a JOKE. I was told 4 times, by 4 different people (including a supervisor) that they had canceled out my account (my request). Not only was this NOT done, but I continued to be billed for the next 4 months. When I called in again to dispute this, I was told that NO ONE had canceled it and that he’d have to go through the phone call records to verify it happened as I claimed. Great! By all means, PLEASE DO, because you’ll find every word of it IS true. He then cancels my service and says he’ll have one of the charges refunded in the meantime (because it’s been long enough that I now have to run a dispute through my bank he says). He assures me that he’s refunding the last charge and will have a supervisor contact me back when the calls had been reviewed. Guess what? No one has called me back and it’s been 2 1/2 weeks. Not surprising, but VERY frustrating. Make sure if you do business with them, you log EVERYONE’S name and date/time you call. (and make sure you’re speaking to the US reps, not the overseas ones). The product itself wouldn’t be bad either if you could log in consistently and the messages weren’t scratchy as hell. Evoice was so kind to help me with the full setup of my phone system and making sure my old numbers got imported over correctly. Being a complete loser with anything digital, it certainly gave me great peace of mind they helped me with installing everything. Handling the system itself is pretty straightforward, making it easy for older team members like many of my colleagues to manage it. This company is one I would avoid dealing with at all costs. I did a one month trial of the service and didn’t fully utilize it, so I signed up to try it further. Little did I know I opened a second account. I didn’t use either account and in October closed the account. They DONT SEND INVOICES, so I didn’t know I was still being billed until I caught it on my December credit card statement. When I called, was told I had 2 accounts and even though there had been no invoice and no activity on the account, they wouldn’t give me a refund. I am so incredibly angry at this company, I would NEVER recommend them or use them again. Be careful. We gave eVoice a try through their trial offering as we wanted to get an additional number anyway and wanted to see how it would work out for our team of 4. The costs saving is something that worked out great, I pay around $150 less in phone expenses now since our switch. Just recently we’ve also added outgoing faxes to our setup, to further make our office digital to allow for two of our team’s member to be able to work from home or from a customer’s office. On a final note I’d like to add that we’ve always received prompt help when needed, something which is quite rare with internet companies from what I’ve experienced before. We’ve been on eVoice’s SMB plan since the start of this year and had a smooth transition. I would have switched to Voip earlier if I had known it wasn’t all so intimidating after all. I can recommend any other business to make the change from copper to an internet phone system asap (it saves money, it’s easy, very convenient,….) 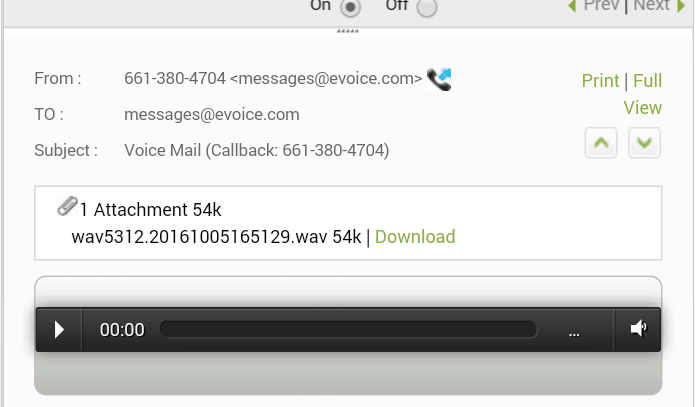 Evoice is working well for us, and I’ve heard good things of Ringcentral.com as well. Very smart system, I love how all the different options work together in having the calls treated the way you want them depending on the time, caller’s wishes, my personal agenda,…. The voice quality is really good with call routing going very smoothly. Just a pitty that sending faxes is a premium option, besides that my plan has all I wanted. We are a company based in Ghana but operates worldwide, can you provide us with eVoice services? I work for a small ad agency where a bunch of us work remotely and are often out and about on the road. We got eVoice since it has the ability to route calls to wherever an individual is at that moment. You can set it up so it first rings through to your home line, then cell phone, etc. You can set up a phone number in whatever area code you want for your business, and can also get a 1-800 number associated with it. You get plenty of minutes with the basic plan and can easily get more minutes if needed. The other features that are nice are the call recording and web conferencing features. As far as customer service, they have always been super helpful if I have ever had any questions or issues. 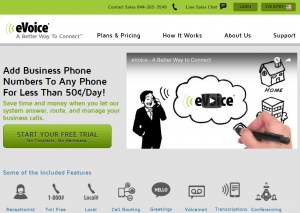 eVoice is definitely worth looking into if you are looking for a low cost virtual phone solution for your business. 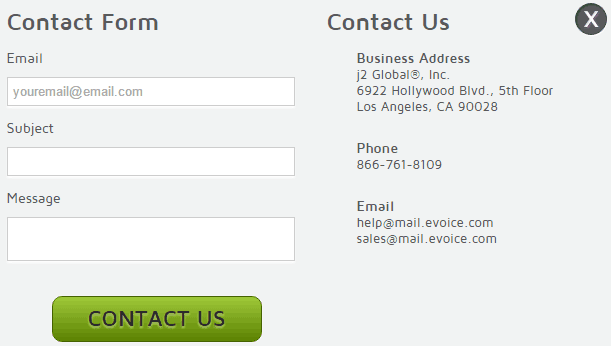 I started using eVoice about a year ago when I first started working as an independent real estate agent. It was a lower cost option than a lot of the other VOIP services I looked into and it definitely had all the features I needed. It also helped me maintain a professional looking image for my business. I especially liked the voice mail to text feature. It allowed me to briefly glance at my voice mails on my phone to see if they were calls I needed to return right away or not. Sometimes when I’m out showing a house, I need a way to discretely check my voice mails and this feature has worked great! I would definitely recommend eVoice. 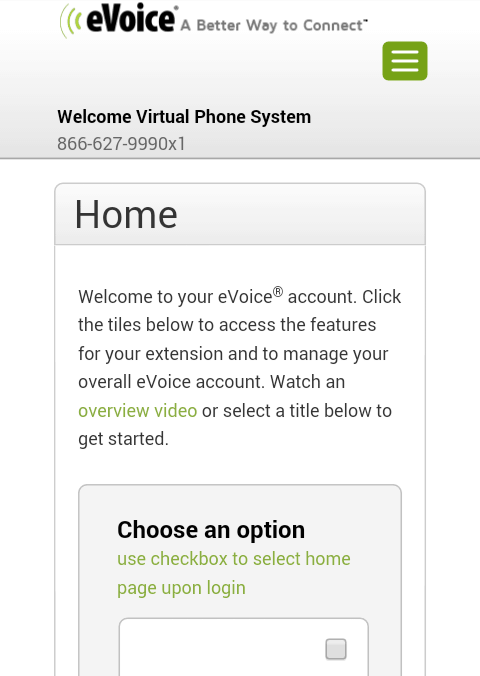 I’ve been using eVoice for a little while now and I found it super easy to set up and very user friendly. I am an entrepreneur and I definitely feel like it has helped in my business interactions by putting a professional touch on everything. The customer support has also been very helpful. I highly recommend! We recently upgraded to a $19.95 plan to have more minutes available – the whole process went smooth and their staff answered our questions and requests promptly and professionally. Their mobile apps work well, the software to configure the phone system is easy to use for someone like me who isn’t familiar to this stuff. My company is very dependent of our phones both for generating sales and giving support to existing customers. I love the fact that we sound like a somewhat bigger company thanks to the auto attendant funcitonality. We also got a Canadian number, since our adverts in Canadian outlets our incoming calls from Canadian prospects have grown nicely. This is certainly worth the investment if you’re operating in Canada. 1. Sometimes the numbers don’t forward properly. I’m not sure if this is a problem with all virtual number forwarding services, but it was a problem for me many times. 2. You have to use an app to make outgoing calls. The app crashes after each successful call and is generally a bit slow. 3. Sometimes it doesn’t allow you to see the number that is calling you. 4. NO PORTING OUT OF NUMBERS THEY PROVIDE YOU. This is probably the number one reason I do not recommend them to anyone. 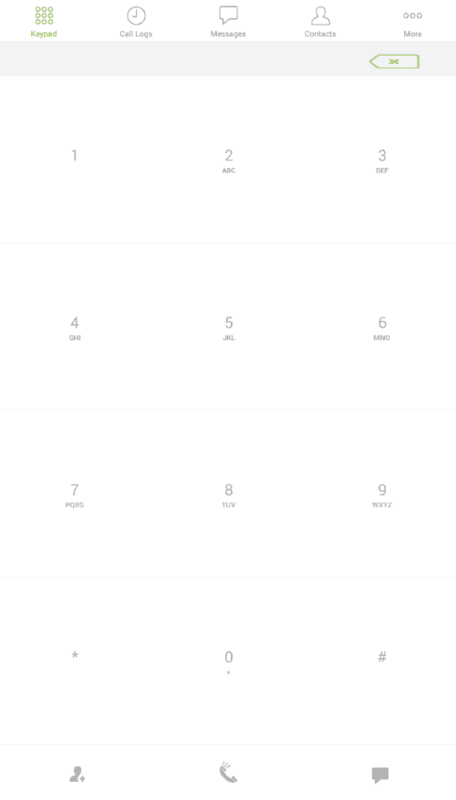 They do not allow you to port their numbers. Once your business grows beyond virtual phone service, you are stuck signing up for one of their plans if you want to keep the number you have been using since you started. I am at the point where a land line will be more useful and productive for my business, unfortunately I cannot port the number. I’m running a one-man business and got to try Evoice and was amazed at how easy it easy to set it up and get it going. I’m using only the basics of the service (I’m not into fancy smartphone apps and stuff), but even that’s worth the low monthly fee to me. I did try their voice mail to text thingy though, but that only resulted in juggled messages lol. I can’t rate the customer support at this point as I haven’t really needed them (yet), but it looks to be decent though.